In recognition of readers who write letters to the editor, The Journal Gazette editorial board each month selects the most effective letter and honors its writer with the Golden Pen Award. Since the program started in 1983, The Journal Gazette has recognized letter writers whose topics ranged from local to international concerns. "Revival of monarchs is up to all of us"
"Southeast-side concerns deserve thoughtful reply"
"Kidney donor is family's hero"
"Heroines, but no heroes, in Kavanaugh process"
"Hurdles for women pursuing a Real ID"
"Transgender woman just wants equal rights"
Elizabeth Evans has been selected as The Journal Gazette's 2018 Letter of the Year winner. In the judgment of the editors, she had the most effective letter to the editor in 2018. Evans was born and raised in New Jersey; she moved to Fort Wayne with her family more than 15 years ago. 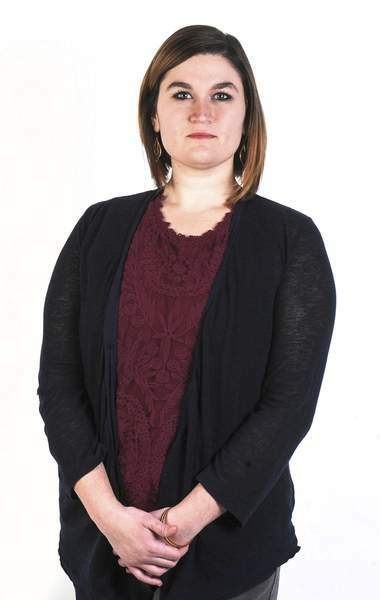 She earned a bachelor's degree in social work from the University of Saint Francis and has worked for the past five years with a local social service agency. The Golden Pen Award was established to express our appreciation for the contributions our letter writers make to the editorial page. My 30-something husband was recently pulled over for speeding - straightforward enough. After providing the compulsory items to the officer and while waiting for his citation, he gave me a call to let me know he would be late for dinner. A short while later, the officer again came to the window to inform my husband that (in addition to the second trooper who pulled up), a K-9 unit would be arriving momentarily to perform a vehicle search for narcotics. Feel like you're missing something? Let me rephrase. My African-American 30-something husband was recently pulled over for speeding. Upon rolling down his tinted window to provide the necessary documentation to the officer, it was determined that he smelled like Axe – and, despite the lack of criminal history and the many reasons one might wear fragrance, Axe body spray equals probable cause. A frisk and a search later he was on his way, speeding citation in hand. In all reality, my husband could have been acting a lot of ways – and he kept his cool. Upon conclusion of the interaction, he shook hands and reported an understanding of what had happened – you're just doing your job. However, after our earlier conversation ended, his wireless headset remained on. Whether purposeful or not, this connection provided assurance, assurance that if this man – a son, husband and father of two – didn't come home for dinner (at all or ever again) – we would know why. This is my statistically justifiable fear, and reality. In 2018. If profiling is a part of your job, then it's a part of mine, too. Let's all look out for each other, shall we?